Finally! Here is the World Language Lesson Plan Check List I’ve been promising you. Click HERE to access it. Then, we’ll talk about how to plan a great closure activity. We’ve written our learning goal, inserted tension into the lesson, hooked students in with an attention-getter, chosen our resources and strategies, taught our lesson, checked for understanding, provided comprehensible input, assigned guided practice and now…. The envelope, please. We’re ready for students to demonstrate their proficiency. And to evaluate the effectiveness of our plan. Gulp. We do that with the closure activity. So, ALL students present. OR, ALL students are engaged in an activity during the presentations. 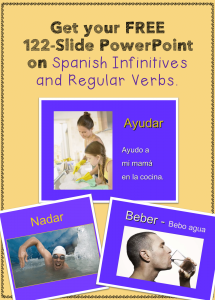 For example, students could fill out a handout, writing in the main events, summarizing the presentation, or counting how many times the presenters use the imperfect vs. the preterite. This component of the closure activity is vital. I eliminate any activity that excludes students or has them passively sitting in their desks. Therefore, that hilarious activity in which three students sit in front of the class while several students ask them questions (and others gaze out the window) is not an option. Choose the activities that engage ALL students. During presentations, make sure the observers have a responsibility as well. If the learning target is, “Students will write about what they like to do,” which activity would be more proficiency based? Students write a paragraph about what they like to do. Obviously, #2 is real communication while #1 is not. One of the main closure activities is the assessment, which, often, is NOT fun. But it doesn’t always have to be dull. While the idea of what is considered FUN is subjective, some activities are more enjoyable than others. I keep a list of fun activities, so I don’t bore my students with the same-old games. Eight Stations Activity: Set up stations in the room with one person at each station who asks questions. It is important to note that the closure activity does not have to take place the same day as the direct instruction (if by closure you are referring to student demonstration of the learning target). In many cases, that is impossible as more time is needed for students to practice. Now that you know how to plan a great closure activity, reflect on what you might add to the list. I’d love to hear your ideas. What activities do you use for closure? Don’t forget to grab your World Language Lesson Plan Check List to make sure you don’t forget any vital components of a successful lesson! If you would like to receive more freebies and teaching tips in your email, subscribe HERE (Make sure to scroll down). Next time we will discuss ways to fulfill the National World Language Standard, “Communities”. By doing so, we will explore how students use the language outside the classroom. Stay tuned!